Wet Paint Pottery runs a variety of unique pottery painting and canvas painting classes for kids and adults. Register in advance to secure your spot! Visit our event calendar to find a class that works best with your interests and schedule. Our adult art classes include pottery painting, glass fusion, canvas painting, board painting and string art. Check back often as from time to time we add other fun and unexpected classes! Come make this rarely offered shape in our fused glass studio. Our knowledgeable instructor will show you everything you need to work with glass to make this absolutely beautiful piece. Class is for guests age 13 and up only. Join us every Thursday from 6 - 9 to enjoy some child-free time and save some money. 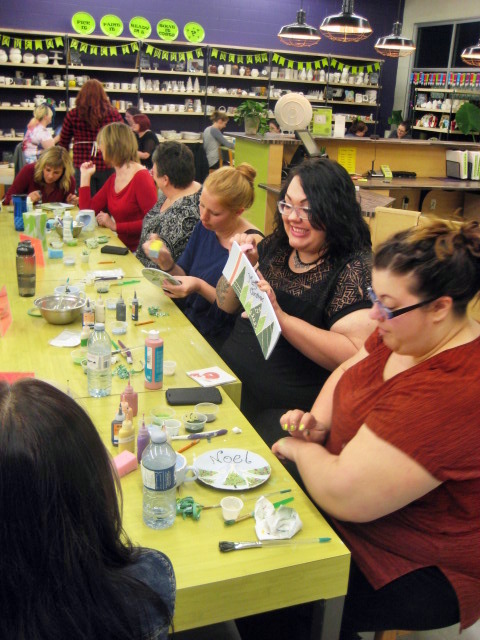 All guests must be 13 or older on Ladies Night and your paint fee is only $4.00! YOU SAVE $5.00!!! Come learn the basics of glass fusing from a professional glass artist and create a set of 4 adorable garden markers in your choice of veggies! Class is for guests ages 13 and older only. Join us and learn the basics of glass fusing from our glass artist and create a pretty set of 2, 6” sunflower dishes in your choice of color. Class is for guests ages 13 and older only. Registration is for one person (cannot split the class). Join us to make your own summery fused glass pineapple candle front. Our qualified instructor will walk you step-by-step through this 6” X 8” piece in your choice of colors. Class is for guests ages 13 and older only. Join us to celebrate our birthday!! $5 ticket includes pottery piece to paint at our party, snack/drink and a loot bag. Ticket price is per child and event is for guests ages 4-12 (supervised by a parent). Value $35. Save $5 on 9x12 Artboards! Drop in with your Lil’ Picassos ages 2-6 on Tuesday mornings or Wednesday afternoons and join us in our new kids canvas studio to make the months featured projects or create your own design. It’s a great way for kids to use their imaginations, explore art tools and create a one-of-a-kind piece. The best part is you can leave the mess for us! Save $5 on 12x12 canvas! Drop in with your 6-12 year old on Friday evenings and save $5 on a 12x12 canvas in our new kids canvas studio. Try out one of our monthly featured designs or create your own. It’s a great time to exercise your creativity and make memories. We have all the fun tools, you bring the ideas and leave the mess to us!